This DVD is dedicated to the wonderful career of Edward Kawak who passed away in 2006. On Sunday 26th September 1993, in Newcastle England, a new chapter in British bodybuilding history was born. It was Rafik Caprelian's staging of the first ever GOLD STAR CLASSIC for men, with amateur and professional divisions. An international field came to do battle in this spectacular event with the standard and condition of the contestants quite awesome. M.C. for the evening was U.S.A.'s "Golden Eagle" TOM PLATZ, who gave us all a rare treat by dropping his trousers and posing those still incredible legs! Amateur winner was big blond American PETER LAREAU. He was probably the hardest looking competitor in the whole event, possible nudging out a ripped ED KAWAK in this department. ERNIE DOZIER of Germany was second, with the handsome Frenchman PATRICE THOMAS third in the Amateur contest. The professional division was a tense and exciting contest. The major prize went to a sensational ED KAWAK of France, formerly of Lebanon. Second place went to the huge and ripped SELWYN COTTRELL of the UK. A ripped and symmetrical ABDEL BOUHAFS of France edged out the classic physique of JOHN TERILLI of Australia to take 3rd place. For the many Terilli fans, we have included all the comparisons and posedown of the top 6 pros at the show. 5th place went to the ever popular English star ROCKY FOSTER with CLAUDIO MOSTACCI of Italy taking 6th in his pro debut. As an indicator of Ed Kawak's condition, one week later he went on to win his 5th NABBA Universe title, becoming the first champion to win this title 5 times. This feat has since been equalled by EDDY ELLWOOD who took 5 in a row. The 4 international standard GUEST POSERS were PATRICK NICHOLLS, SUSANA PEREZ, BERNIE PRICE and LAURA VUKOV. The posing from all competitors is shown plus key comparisons from the judging of the Professionals through to the awards. The complete results are listed below. 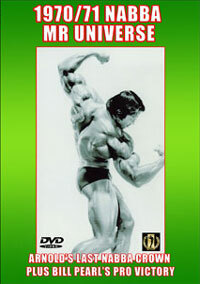 Eduardo had a bodybuilding career of over 20 years in both the NABBA and the IFBB federations. 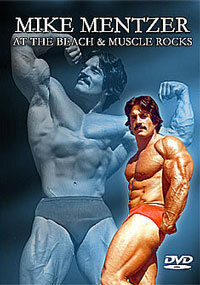 He won his first amateur NABBA World's Championship to become a pro in 1980. 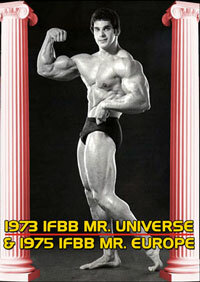 After that he won a string of pro NABBA Mr. Universe titles with four straight victories from 1982 through 1985. Many thought at the time that Eduardo could have continued to win the top NABBA pro title as long as he wanted to, but he decided to compete in the IFBB in 1986 to see how he would do in the rival federation. Maybe the Weiders felt that this rival from another federation should not shine too brightly, so Eduardo struggled with his IFBB placings. 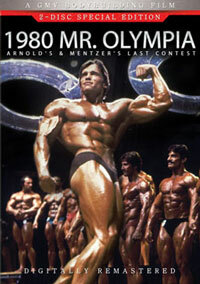 Nevertheless, in 1987, Eduardo placed eighth in the Mr. Olympia and eighth as well in both the French and German Grand Prix. 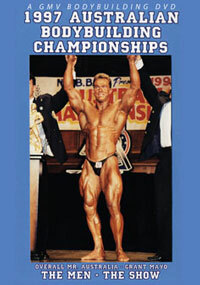 In 1993, he again competed in the NABBA Pro Universe and won it for a record 5th and final time. This record has only been equalled by Eddy Ellwood who won 5 in a row. Eduardo then competed in either NABBA or the IFBB after that. He last competed in the Masters Olympia in 1999 and placed 13th, which again seemed to reflect more upon the judges than upon Eduardo's physique. Eduardo Kawak, resident of France, passed away in Beijing, 2006 while visiting China to promote bodybuilding. He was 47 years old. He is survived by a 17-year-old daughter and a brother who also lives in France. Interment is expected to be in a family gravesite in his native Beirut, Lebanon.